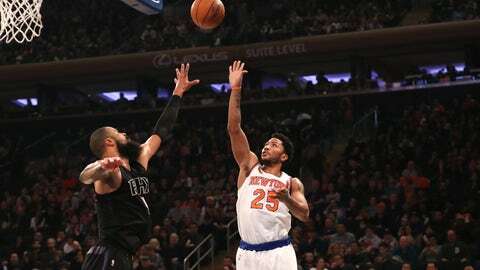 The New York Knicks could decide to trade Derrick Rose at the deadline. Rose remains focused on playing at a high level and winning games. The New York Knicks are approaching one of the most important days in franchise history. The 2017 NBA Trade Deadline will go a long way towards determining the trajectory of Phil Jackson’s tenure as team president. Though not explicitly mentioned in trade rumors, there’s a growing belief that Jackson could trade Derrick Rose at the deadline. Rose is playing on an expiring contract that will make him an unrestricted free agent in 2017. He’s reportedly seeking a max contract, which could push him out o the Knicks’ price range and create a scenario where Jackson lets him walk in free agency—or trades him beforehand. According to Marc Berman of The New York Post, Rose is drowning out the outside noise and focusing on becoming the player he believes he’s capable of being. Love him, hate him, or feel indifferent, that’s all you can ask of Rose from a basketball perspective. Rose has shown flashes of greatness during the 2016-17 NBA regular season. He’s put up two 30-point games, eight games with at least 25 points, and 16 games with at least 20 points. That includes a stretch of four consecutive 20-point games in the days leading up to his current ankle injury. Since returning from a back injury on Dec. 20, Rose is averaging 19.8 points and 4.5 assists on a slash line of .454/.278/.896. That 20-game sample size offers undeniable reason for optimism, albeit with concern about his facilitating and 3-point shooting. Unfortunately, the injury bug has found a way to bite Rose throughout his NBA career. Here’s hoping he can return strong from his unfortunate ankle and injury to build on what’s becoming alluring success. Must Read: Should the New York Knicks trade for Emmanuel Mudiay? With the 2017 NBA Trade Deadline looming, the New York Knicks may be conducting their final evaluations of Derrick Rose’s immediate future.